Sitting inside of a gazebo on your property is an excellent way to enjoy the great outdoors while shading yourself from the elements. Many homeowners have opted to add gazebos to their backyards and gardens both as focal points for their properties and for the practical purposes they serve. There’s nothing quite like spending a summer afternoon or night sitting in a gazebo while enjoying a fresh summer breeze and the sounds and smells of the season. But did you know that countless millions of people have enjoyed the exact same thing for thousands of years? Let’s look at some of the history behind gazebos. The very first gazebos were actually built more than 3,000 years ago, but weren’t intended for relaxing in the garden. Instead, these early structures were rooftop watchtowers, according to Scout. They allowed for those inside of them to keep a lookout for potential invaders. However, it was the ancient Egyptians who constructed the first ground-based gazebos. We see these structures sometimes depicted in murals found in royal tombs, giving us evidence of these structures in use in antiquity. They usually placed them near water sources and used the gazebos to facilitate the growth of vines, flowers and other plants. The concept exploded outward from there. The Persians and Greeks took the concept of gazebos from Egypt and further evolved it. The Persians were fond of using gazebos as a central feature of outdoor landscaping and gardens, whether they served not only as a place to relax and enjoy nature, but also as an honored space for hosting foreign elites and negotiating treaty agreements. The Greeks – with their love of sculpture and architecture – took the gazebo design even further, building them from marble instead and placing as outstructures near temples, allowing them to serve as a place where religious ceremonies could be held. Gazebos didn’t stop there, however, and they also spread east, appearing in cultures in the Middle East, Japan and China. In places like Japan, for instance, they served as a gathering place for preparing and sharing formal tea, a trend that further grew and expanded throughout many eastern societies. The construction and design continued to evolve and adapt through different cultures, but the most common style and shape of gazebos today took hold during the Victorian era of the late 1800s, says Scout. It was at the turn of the century that gazebos began to find popularity here in the U.S., and in the century since, new gazebos have popped up in public parks, private villas and backyards from coast to coast. Add this touch of antiquity to your modern home and enjoy the outdoors in the same way as countless generations before you have, as well. 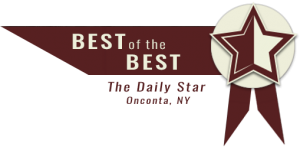 Amish Barn Company offers a full range of gazebo styles and sizes – available in either vinyl or pressure-treated wood construction – so you can find the perfect look for your home. 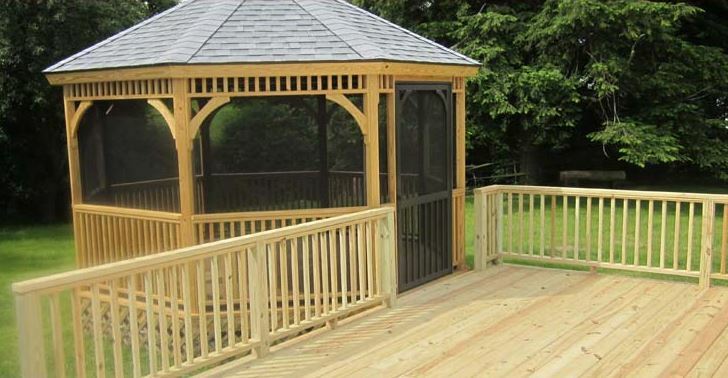 Call us at 607-432-0527 to discuss the gazebo options we offer or to order a new gazebo today.